The original CVA dampers were leaking and just not in a good place, so got some Absima alloy body shocks which work well with the car for bashing about. At this point I also managed to pick up some Terra Scorcher wide shock mounts as I read these were better than the narrow original style. Rear ones work a treat, but fronts not only foul the body of my Thunder Dragon, they flexed like mad! 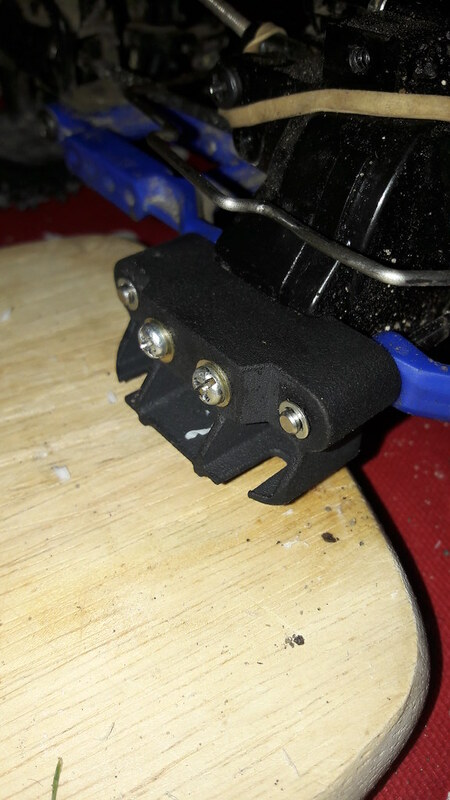 So, inspired by Pintopower/AMPRO Engineering, I measured everything up and got a beefed up, wide stance front shock mount designed up and 3D printed at Shapeways. 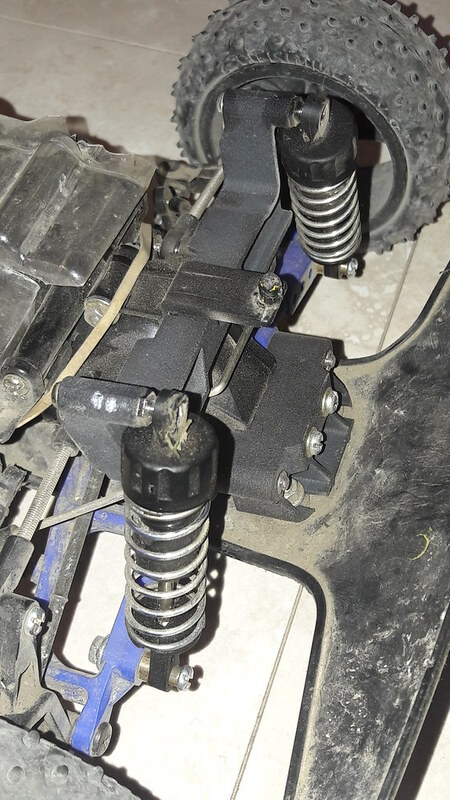 It's a bit hard to see in the photo, but it's a deep i-beam section which puts the uprights outside the TD body and allowed me to mount 62mm mini shocks on the outer most hole of the front wishbones. Due to the scarcity/price/performance of the original wheels, I did a 12mm hex/2.2" modern wheel conversion. I think these black 6 spokes look really nice on the car. 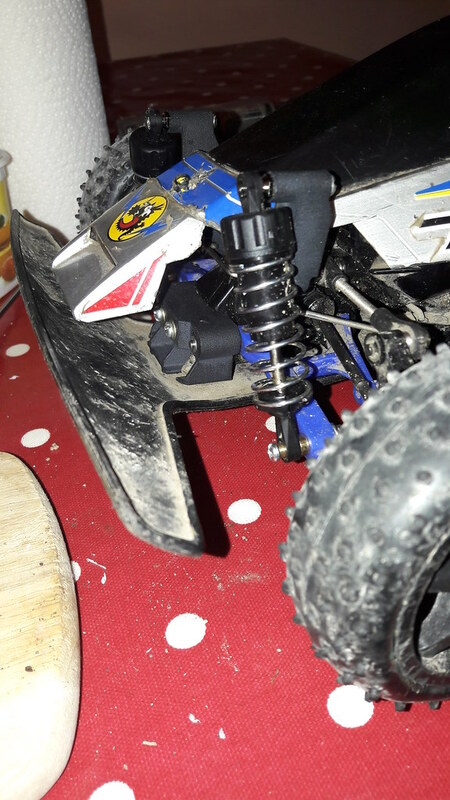 Full bearing inside and out, a modern ESC and 21t brushed motor and 13t steel pinion from Modelsport here in the UK (where I get most of my RC stuff actually). Still running original ACOMS receiver and steering servo, although after tonight's run and my newly acquired knowledge from on here, I think a better servo saver would be good. Most recent upgrade was the rear Terra Scorcher anti roll bar. Absolutely transformed the handling of the car. I've removed the front bar now too as the wide stance mounts and new shocks hold it up nicely. It's now bordering on oversteery on turn in, and I grip rolled it tonight too which I never did before! 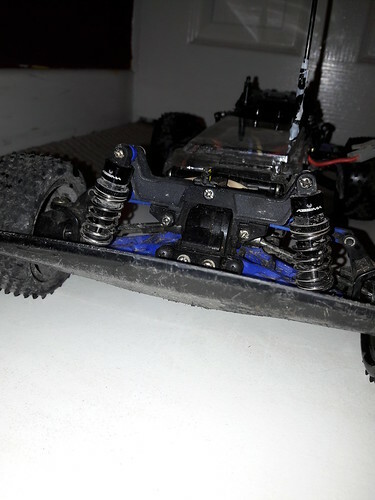 If you have a Thundershot chassis car GET the rear anti roll bar. As you can see it's a bit rough, but it's a runner and I love it. It has all the upgrades I wanted to buy when I was 13 but couldn't afford! 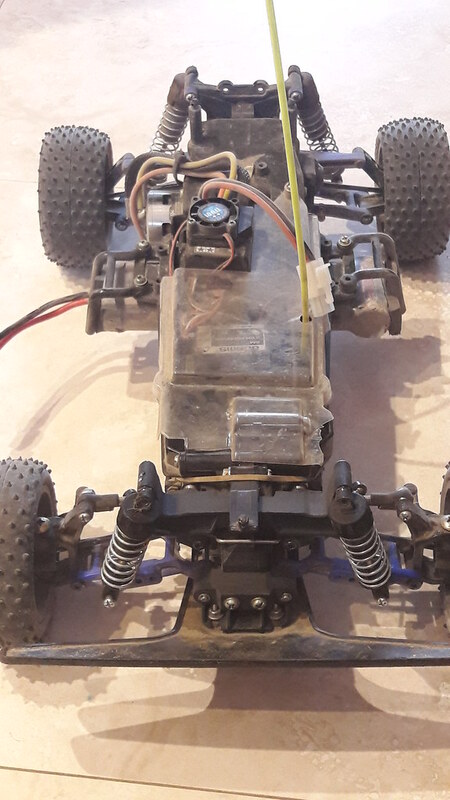 I would really like a new shell I could paint properly, but they're insane money now and I don't like any of the other TS chassis shells. Thunder Dragon has always been the one for me. Would love to know what you think, and if you have any suggestions for any more hop ups. 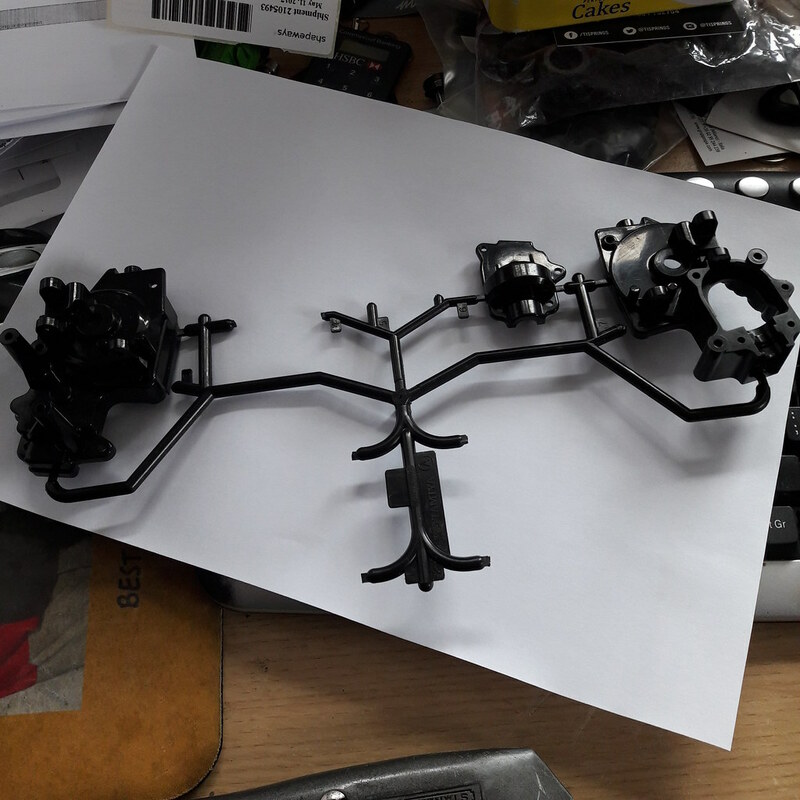 I have brand new front gear casings on the A-sprue I bought to get the rears, so might refresh those as they're prone to cracking on the suspension mounts. Now I've been running a 3300kV brushless setup in my Grasshopper 3 I'm getting a bit tempted to go mad and get a GoolRC 3800kV brushless kit for this! Looks great! I'm just restoring mine at the moment. I can't bear to move away from original design/hop ups so I can't recommend anything sadly but looks and sounds great what you've done. I was considering 12mm hex but by the time I would have got those, wheels and tyres I didn't see the point and went with originals. That said I was struggling to find wheels I liked and love the look of the egress ones and the ones you've put on yours don't look too dissimilar. What wheels are they that that you've fitted? I got the wheels about six years ago. Can't find what they are. Sorry. Shame but if anyone has any ideas on here please let us know. 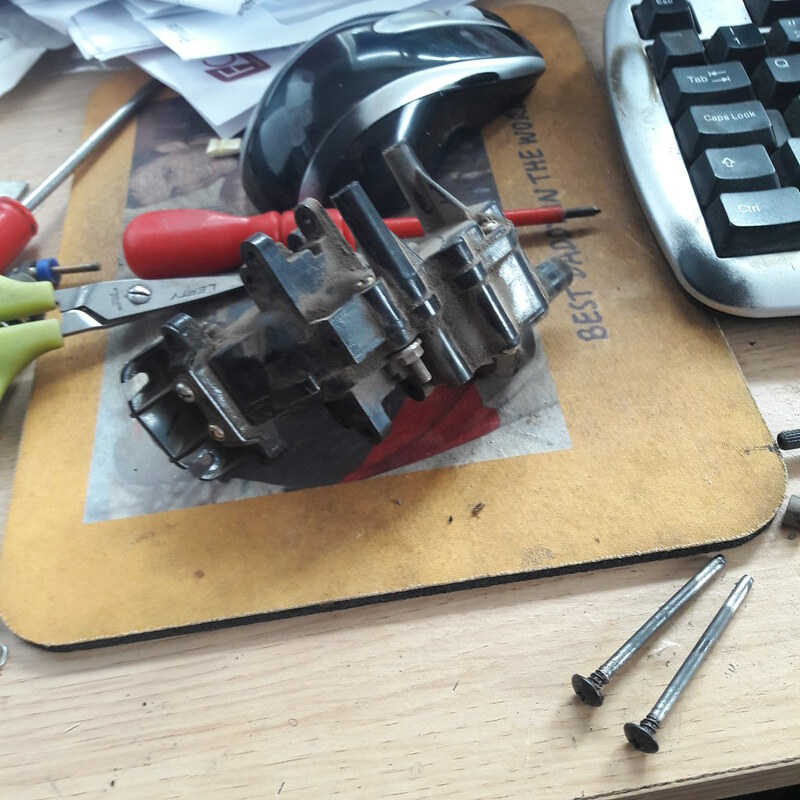 I read round when I was looking at replacing my original 540 that brushless isn't wise unless you replace all of the gearing inside so not sure that would necessarily be a good option but I could be wrong. Just put of interest what was your newly acquired knowledge regarding servos? This may be an emarrasing question but what is a servo saver? Slightly off topic. Do you happen to know how I would follow a topic please? For example I would like to follow new posts in the tamiya section. Currently on a mobile device of that makes any difference. Yeah, I have seen conflicting views. I have already geared down to 13t pinion for the slightly hotter 21t brushed motor I currently run so that would help. I don't use it much or that garden so brushless probably fine. Would like an experienced view though. There are lots of nice black colour 4wd hex wheels out there in 2.2". Tamiya DF03 will fit, schumacher, carson all do nice wheels. If you're looking for tyres get some schumacher blue compound mini spikes. Good value and great tyres. 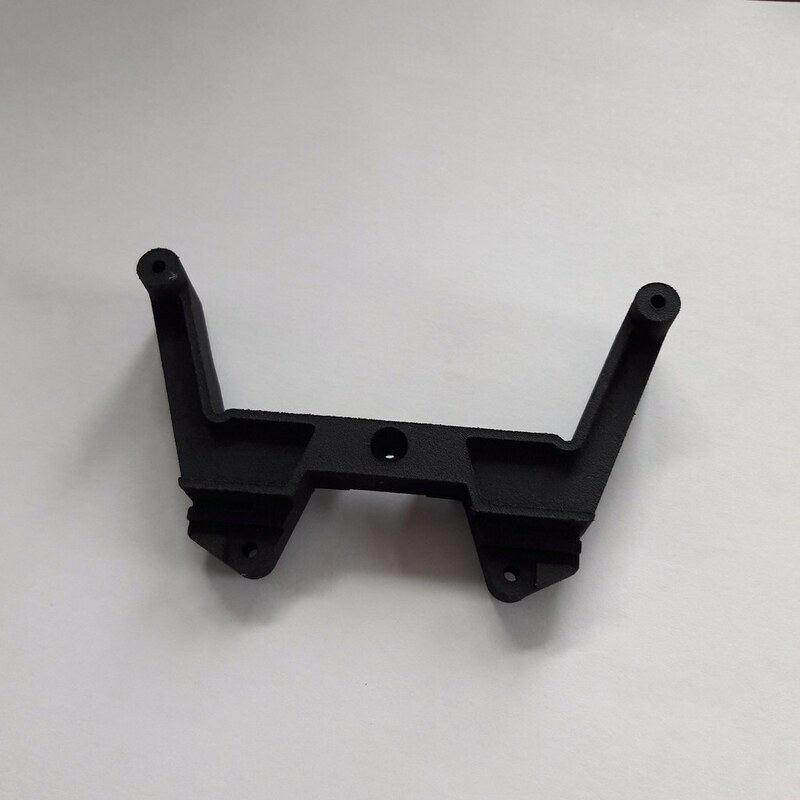 Servo saver is the little plastic doobry that connects the servo spline shaft to the steering arms. Only just found this out myself!! Tamiya ones are pretty baggy even when new. Got a Kimborough one for my grasshopper3 and it's loads better. 25t spline is what you need. Regarding notifications there should be a little slidyou switch button bottom left you slide to right before posting which gets you notifications. Thanks for the info. Will have a look. Not sure about that. Only just started here myself! Those wheels and tires look very similar to a set I bought off a Chinese e bay seller a few years back , if you search 1/10 scale rc wheel you will come across lots very cheap. I'm just in the process of tidying up my original shell. Over the years my dad had tried his best to repair and reinforce it and to be fair had done a pretty good job. Parts of the paint had come away and the old araldite was, well old. So I stripped off the old glue. Found the original tamiya colour and have been reinforcing it again and tidying it up. I've kept the original cut bits of circuit board and reusing them as they worked then and they will work now. 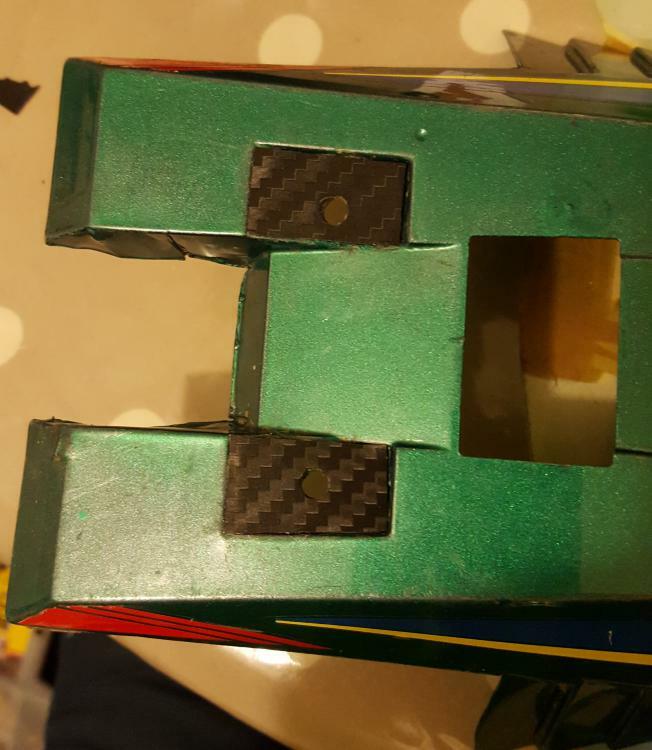 The parts where the 2 pin posts go at the back had gaping holes so I have used some green stuff / milliput to rebuild and add extra strength. The plastics I've used towards the back I've then covered in 3m carbon affect vinyl. I've not used PC paint before and loved how it adds like a flexible coating when applied. Pic of the top. Don't get me wrong it's not perfect but just wanted to get it as good as it could be. Interesting colour. I like seeing them in something than silver. Tempted to go neon orange if I get hold of a new shell some time. I'll take a better picture of the whole car once I've finished with it. The shell looks better when it's not a close up so you can't see all of the scars so much. I find it difficult to get inspiration sometimes for the TD as not many people deviate from the original design or post pictures. Got looking at servo savers. Is this the one you've got that would be suitable for the TD? That's the one I have on my DT-03. 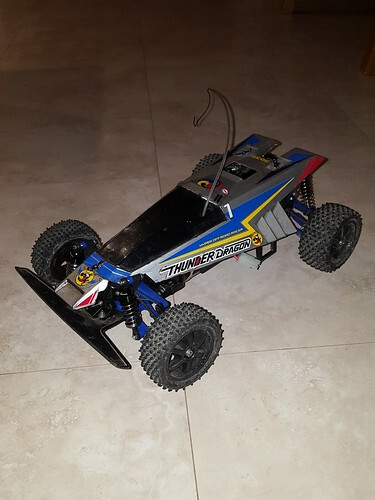 Just got one for my Thunder Dragon but haven't fitted it yet. Please could you let me know how you get on? Don't want to buy one if it doesn't for the TD. 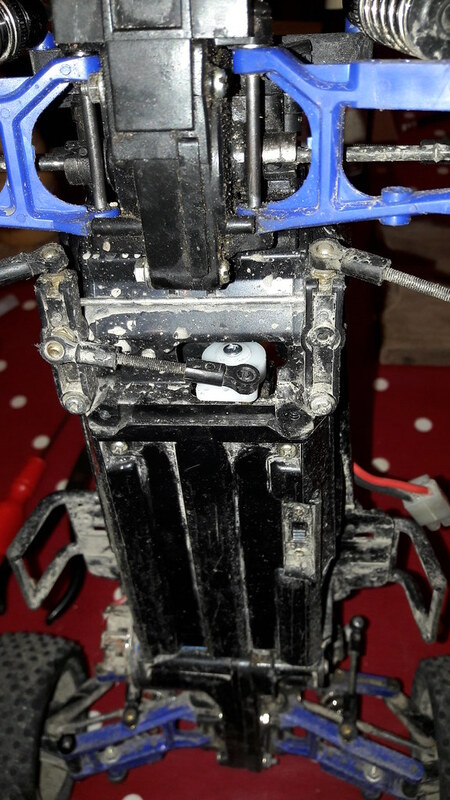 Got the servo saver fitted. 114 is the one. It's tight on the splines. Needs fair pressure but does fit. I think that's a good thing. Steering is waaaaay more responsive. 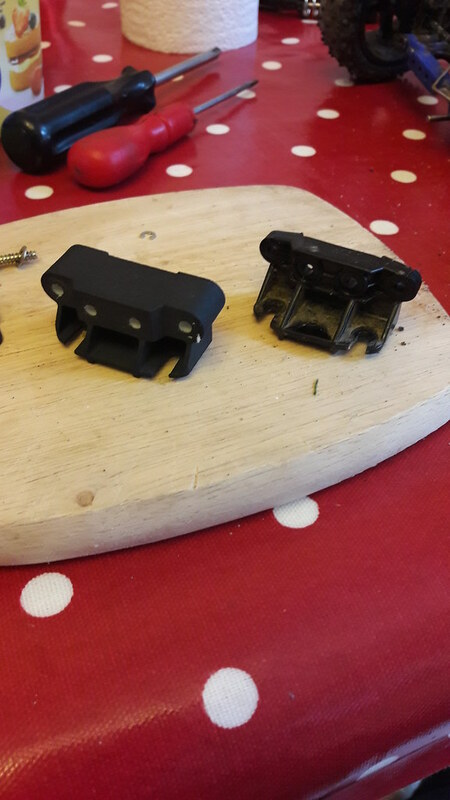 Since doing the conversion I've been trying to get a handle on the handling, and absima dampers have been respectively too soft/slow/blown up (rear) and turned out to be 8mm travel touring car dampers (front). Decided to go back to basics and get CVAs. Rear set went straight on with 2 hole pistons and 30 wt oil as I have since got a 8.4v pack so it's pretty heavy. Running the stiffness DF03 setting springs. Still not quite right but getting there. The screw pins shown keep backing out of the (quite battered) A5 part so found a set of suspension shafts with a 58.5mm long set for replacing these. The shafts and dampers turned up today. I've had the shock mount a couple of weeks. Currently using one of the shock spacers from the CVA kit to space out the long shaft, but the extra length has given me an idea about a reinforced A5. Need to check it out, but a longer pivot support for the longer shaft would really strengthen this area. And with 70mm CVa Mini Shocks and stiff DF03 springs. 2 hole pistons with 40wt oil. More on the handling and how it's working when it stops raining. Got a delivery from Shapeways last week. 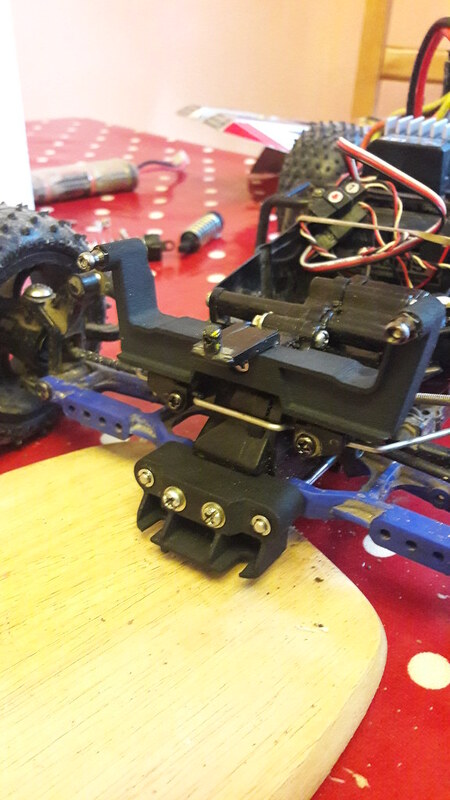 As well as my Super A5 part I did order a revised shock mount to clear the body properly. 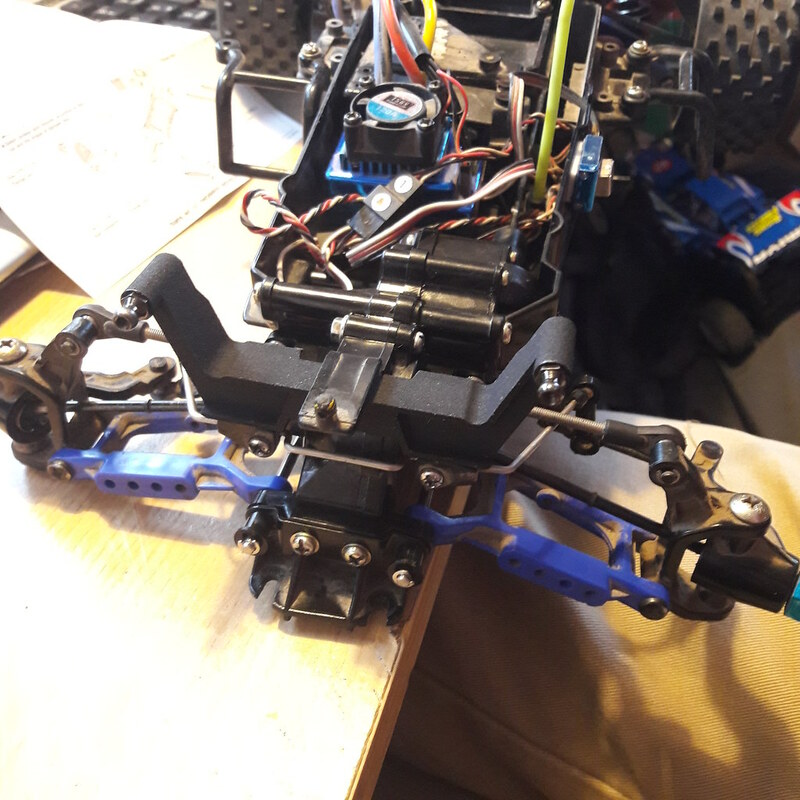 I am now finally happy with the front shock mount! Here's the Super A5 next to the original. 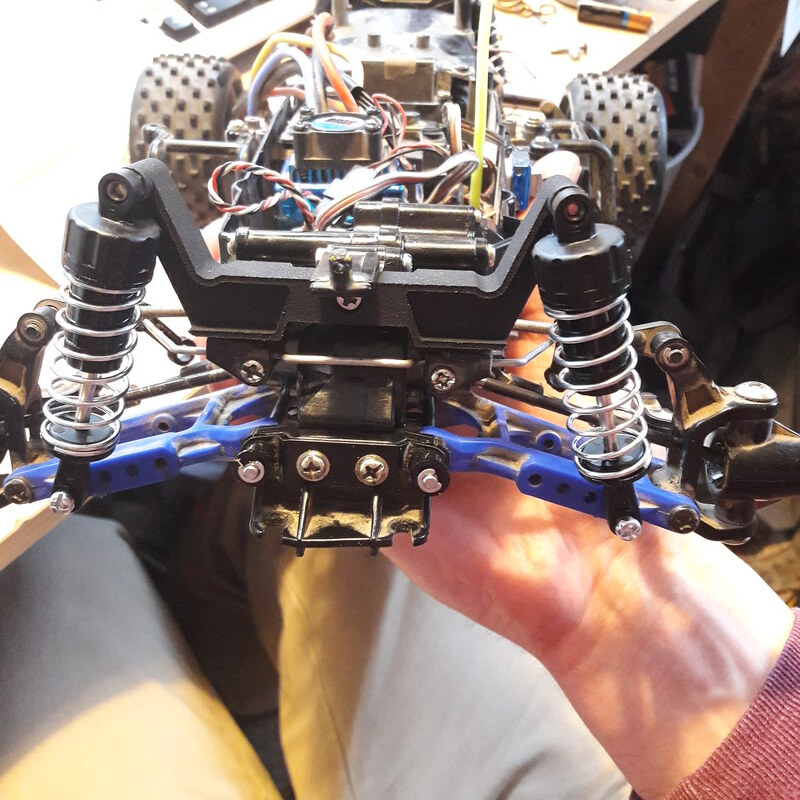 Taking advantage of the 58.5mm long M05 suspension shafts to extend and increased the wall thickness on the suspension mounting. And all installed. 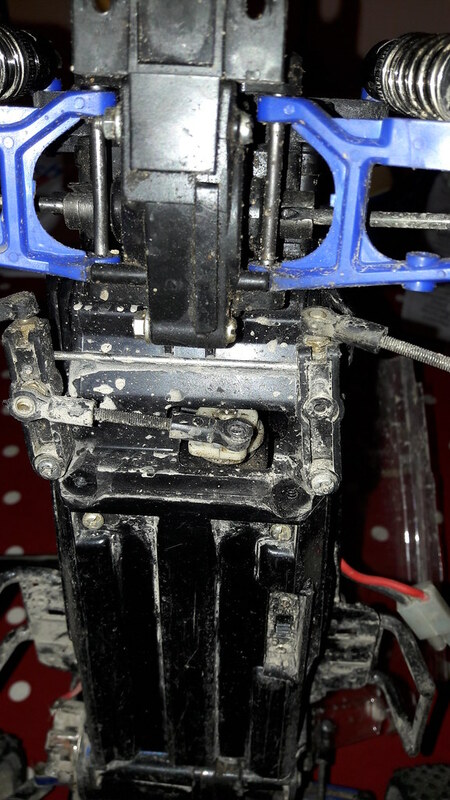 Need m3 x 20 machine screws to replace the original mounting screws. 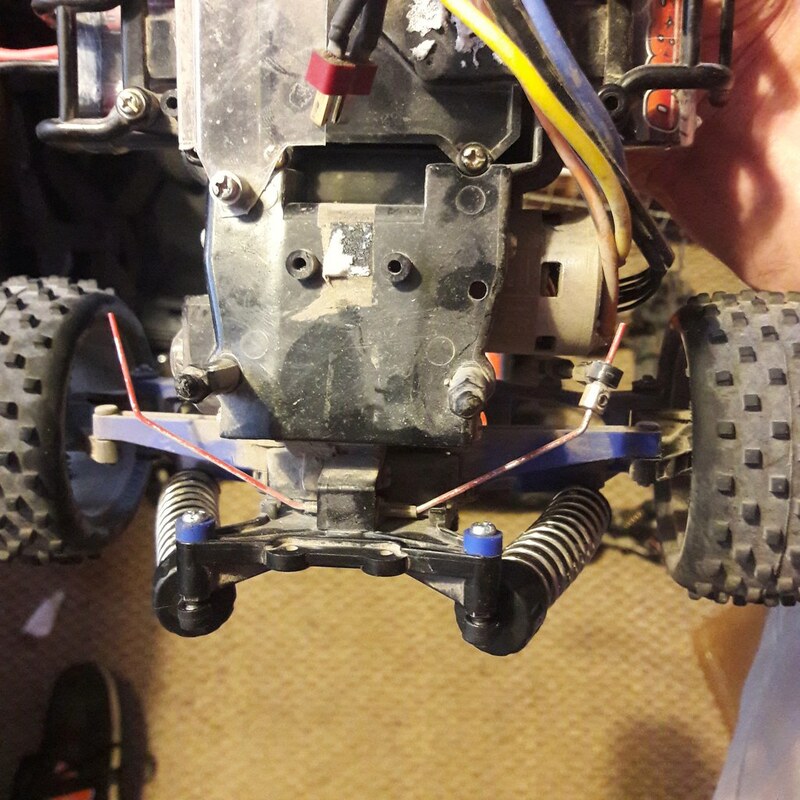 Wide stance shock installed with ball connectors for 70mm CVA shocks. I will run the parts for a while to make sure I am happy with their strength then look to open a Shapeways store to sell them. 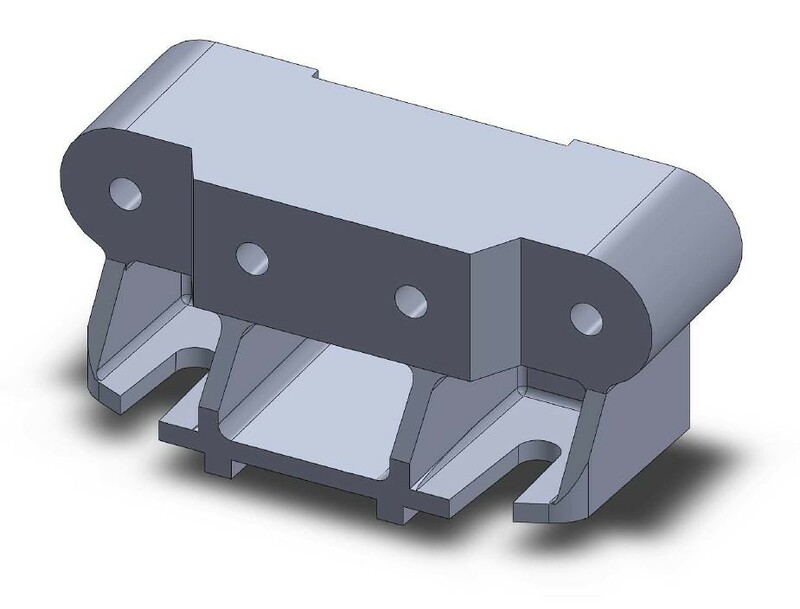 A5 parts have become very very expensive and the aluminium replacements are over £30 with shipping. This should quite a lot less than that. Been doing a little bit with this. Still got the stiffest DF03 springs rear with two large preload collars to hold up the 8.4v pack. Would like something a little stiffer. 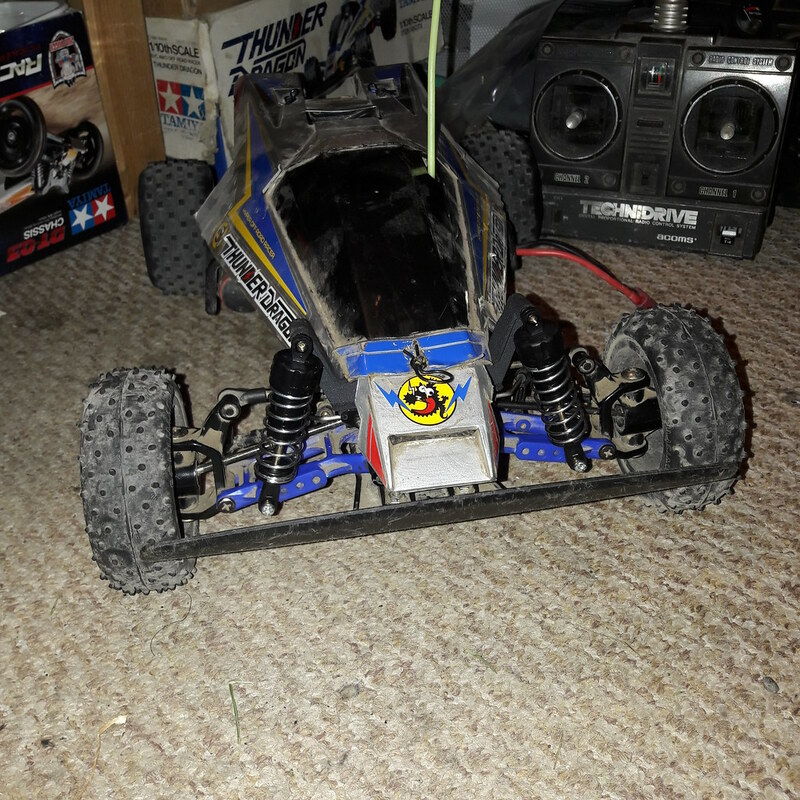 Tried schumacher blue xr3.5 springs today and they aren't long enough even though stiffness seemed ok. 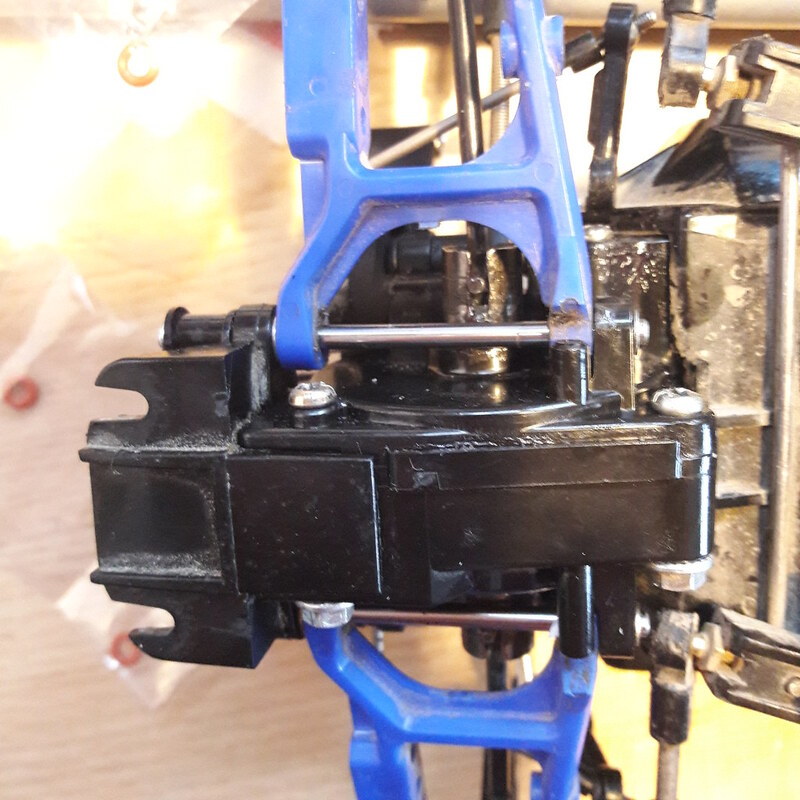 I have gone down to the gold medium springs at the front which seems good to get a little more grip now the ride height is right with the shock mount. Super A5 seems spot on. Popped some Yeah Racing Df03 Universals in the front. Given more steering lock and smoother too. They're only about a tenner on eBay at the moment. 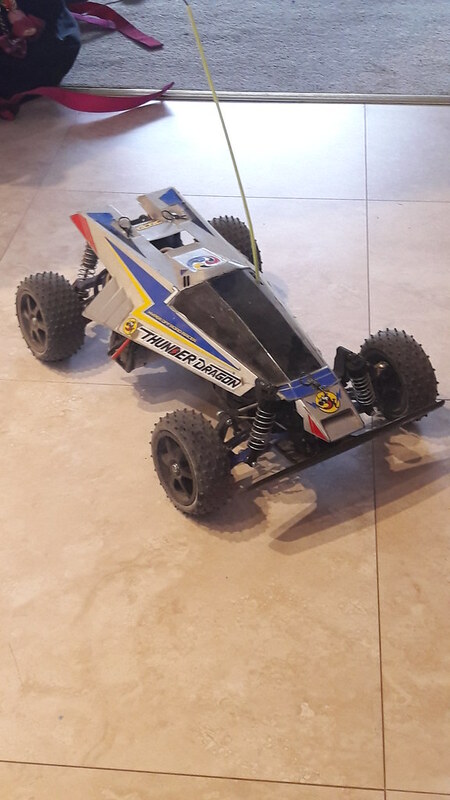 Also decided 10.5t brushless was a bit mental and got a 17.5. Runs lovely! I've been doing some reading on here and googke but I'm not sure 100% sure. To convert to hex wheels is it just a case of buying 4 hexes to replace the triangle drives. 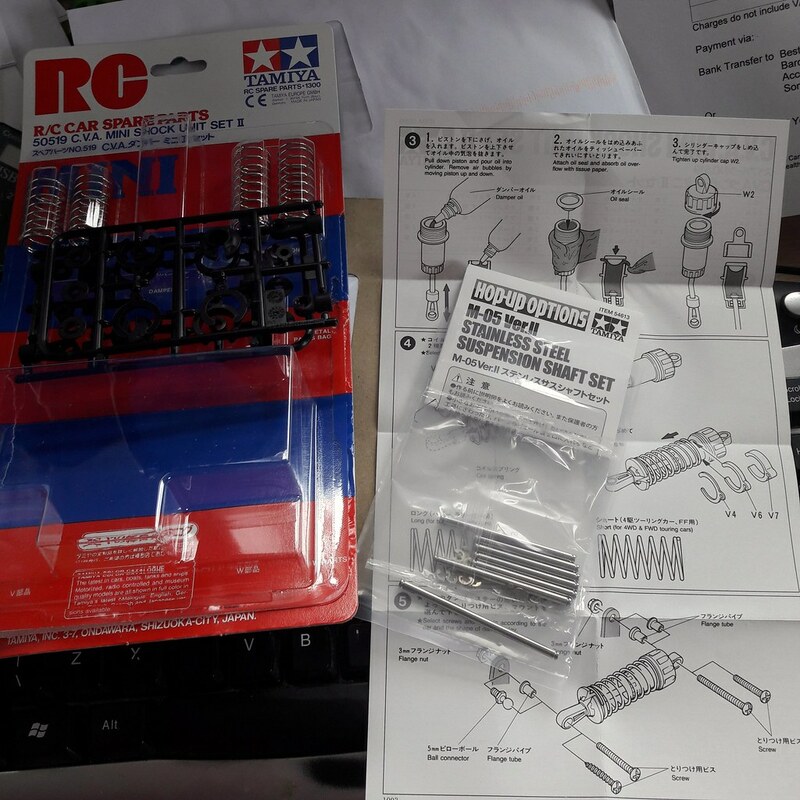 I'm filling a basket on modelsport now with parts.